ST. LOUIS - Starting immediately, any Webster University student, faculty or staff member with a parking pass can park in the YMCA Parking lot. The lot is located at 226 E. Lockwood Ave., just two blocks west of Webster Hall. The lot is approximately the same distance from Webster Hall as the Parking Garage. The lot was leased earlier this summer and designated for employees in specific units. During the past two weeks, an analysis by Public Safety concluded that the lot was being underutilized, as many of the spots remained open throughout the day. 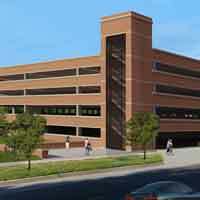 Last month, the University announced a number of measures that had been taken to reduce parking problems while construction crews work on the Interdisciplinary Science Building and expand the existing Parking Garage. The expanded garage is expected to be finished in the spring with 820 news spaces added to it. The full parking announcement can be found online at http://news.webster.edu/construction/2016/parking-alternatives-announcement.html. In a related announcement, Nerinx Hall High School and Webster Groves High School have warned that they will tow any cars from their lots that do not have the proper parking permits from their respective schools. It is advised that Webster University students, faculty and staff avoid parking in those lots.